Piro is a pushover otaku and fan of dating sims. Largo is a volatile and video game-obsessed man who "5p34k5 l33t." And these two losers just got themselves stuck in Japan. Now, without money to buy a plane ticket back, the two men must try to gather the money while avoiding the dangers of creepy Japanese women, rentable Godzillas, some violent friends of theirs, a life-size dating sim accessory, Japanese schoolgirls, and hordes of zombies. Oh yeah, and some romance as well. Megatokyo is a comic that begins as a joke-a-day comic that plays on Japanese, American, anime, and video game cultural stereotypes. Eventually, it turns into a very serious story about the disparities between nerds' fantasies and the real life. Yes, that is a rather major shift. For the sake of a better review, I have written two different reviews of Megatokyo. 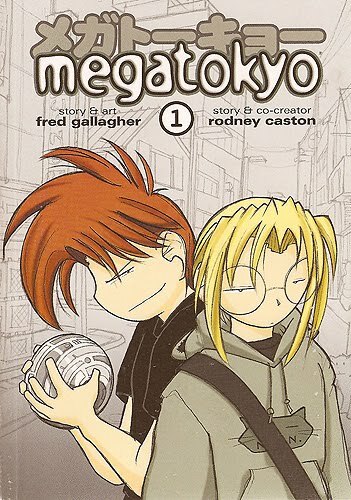 The other one reviews the span of early comics in which Rodney Caston was the co-writer of Megatokyo. This one follows the time period after Piro and Largo split up, leaving all art, plot, and humor to Fred. In June of of 2002, Piro announced that Largo had officially left Megatokyo. His final strip, contained in Megatokyo volume 2, was published to the site on February 4th, 2002. Citing major creative differences, Fred and Rodney decided that it was "better for Megatokyo" for them to split and leave Piro in charge of everything. Largo was given money in exchange for him selling all rights to the property to Piro. For a time, Fred Gallagher is able to keep up the momentum created together by himself and Rodney Caston. Through the second volume through most of the third one, we are kept entertained by Largo's insane antics. Piro's story becomes much more separated from Largo's, both in terms of distance and literary difference. Piro goes through a long line of emotional troubles, while Largo barely sees him during long bouts of fighting zombies and such. Early in this process, Fred keeps a very good balance between serious and humorous comics, so that readers of many types can still enjoy it. Nevertheless, after a while, he almost completely moves into emotional ground, even turning one of the characters into a love interest for Largo. This type of story can be enjoyable for fans of romantic dramas, but is often just sappy and whiney, due to its focus on nerds. Of course, Shirt Guy Dom, Leave it to Seraphim, and other random in-between strips remain. These, especially the SGD ones, are usually the funniest things in the comic. I still check back with "the new MT" just to see if I can catch a new Dom strip. As one would expect, Fred Gallagher's art becomes better and better the further the comics move. However, I would pinpoint his peak around the end of volume 2/volume 3. At this point, he reaches an equilibrium where his art looks like manga, but is not a blatant copy. It is also much better drawn and shaded than his earlier comics, but keeps the simplicity and cleanness that made the older comics so much fun to read. Eventually, his style progesses even more. While his ability to draw clothing and architecture gets even better the ore he draws, Fred also finds himself drawing bigger and more watery-looking eyes, making him look like just another anime rip-off. The "Piro Era" of Megatokyo is a complicated time for fans of the comic. When Largo left, many fans stayed around just to see if Fred could keep up the original stuff the two created together. Eventually, many fans of the original joke-a-day style left, only checking back occasionally to see what's up with their once-favorite webcomic. Still others stayed, enjoying Fred's new, serious style. It boils down to a question of preference. While I enjoy the combined Largo-Piro style, and I do not like romantic stories, Fred does do some things better. Megatokyo finally focuses on one demographic, instead of scrambling for many of them at the same time. However, I feel that Fred still has not been able to make his romantic storyline as engaging as the humorous one from the early days. The "Piro Era" falls short compared to its predeccessor, but is still an interesting buy for fans of the series, and the 3rd volume will still entertain Lergo fans.